When famed United States writer John Dos Passos rode a train down through the Florida Keys to fabled Key West in the 1920s, he described the trip to his friend Ernest Hemingway as "one of the most exhilarating experiences of my life." A trip down through the Florida Keys can do that to a traveler. The Florida Keys are the Caribbean islands for the Sunshine State and one of the nation's premier destinations for those in search of sun and a great drive. Activities in the Keys range from scuba diving or snorkeling on living coral reefs, spying on rare bird species that rest on remote islands, kayaking in serene backwaters and hiking among divergent tropical flora within dense hammocks. And, thats before one even arrives in Key West. Though it's only 45 minutes by airplane from Miami to Key West, visitors who fly miss one of America's great motor odysseys. The Overseas Highway, often called The Highway that Goes to Sea, is a modern engineering wonder. It carryies autos from Florida's mainland across countless coral and limestone islets all the way to Key West. The jumping-off point to the Florida Keys is Key Largo (MM 105)--42 miles south-southwest of Miami. The longest island of the Keys chain, Key Largo is the site where Humphrey Bogart and Lauren Bacall battled both Edward G. Robinson and a hurricane in the movie of the same name. Even if a hurricane doesn't hit, Bogie's Key Largo connection can be seen at the African Queen, the actual boat that Bogart skippered in the movie of the same name (located behind the Holiday Inn). As the first underwater preserve in the United States, this refuge offers 55 varieties of delicate corals and almost 500 different species of fish for divers and snorkelers. The land-based part of the park also features excellent hiking and camping. Other possibilities in the Key Largo area include the underwater hotel and marine park of Jules' Undersea Lodge and Key Largo Undersea Park and the fascinating Florida Keys Wild Bird Rehabilitation Center. Further south, vistas of the Keys are dominated by emerald-green lagoons, deep-blue seas, nodding palms, rustling pines, and olive-green mangroves. White herons, roseate spoonbills, pelicans, sea gulls, ospreys and other creatures share this paradise with visitors. Islamorada (MM 85) is the centerpiece of a group of islands known as the . The islands feature a heavy concentration of the stunning violet sea snail. The sport fishing capital of the world, Islamorada is heralded for its angling diversity and features the Keys' largest fleet of offshore charter boats and shallow water backcountry boats. Other possibilities include the plant-packed Lignumvitae Key State Botanical Site and uninhabited Indian Key State Historic Site. Islamorada's centerpiece is definitely the famed Cheeca Lodge, which has made a mark in the resort world with its environmentally friendly and educational programs. Of course, the resort's beach, dining, boating, snorkeling and diving don't hurt either. Marathon Key (MM 49) is the heart of the Florida Keys and is home to Crane Point Hammock, a 63.5-acre tract that is one of the most important historical and archaeological sites in the Keys. The area contains evidence of pre-Columbian and prehistoric Bahamian artifacts and once the site of an entire Indian Village. The tropical palm forest is home to rare and unusual trees, plants and animals and the freshwater pond features neo-tropical migratory bird species. There are also two hiking trails, a Museum of Natural History and the Adderly Village Black Historical Site. The Marathon area is also the home of Dolphin Research Center, a non-profit education and research facility, which houses a family of dolphins in natural saltwater lagoons. Here, dolphins of all ages share their lives with visitors and people who have dedicated themselves to maintaining the best possible environment for them and all marine mammals. 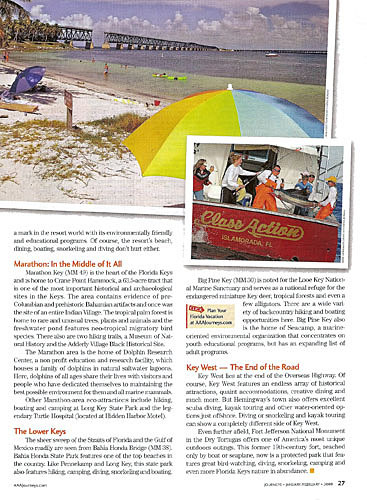 Other Marathon area eco-attractions include hiking, boating and camping at Long Key State Park and the legendary Turtle Hospital (located at Hidden Harbor Motel). The sheer sweep of the Straits of Florida and the Gulf of Mexico is readily seen from Bahia Honda Bridge (MM 38). Bahia Honda State Park features one of the top beaches in the country. Like Pennekamp and Long Key, this state park also features hiking, camping, diving, snorkeling and boating. Big Pine Key (MM 30) is noted for the Looe Key National Marine Sanctuary and serves as a national refuge for the endangered miniature Key deer, tropical forests, and even a few alligators. There are a wide variety of backcountry hiking and boating opportunities here. Big Pine Key is the home of Seacamp, a marine-oriented environmental organization that concentrates on youth educational programs, but has an expanding list of adult programs. Key West lies at the end of the Overseas Highway. 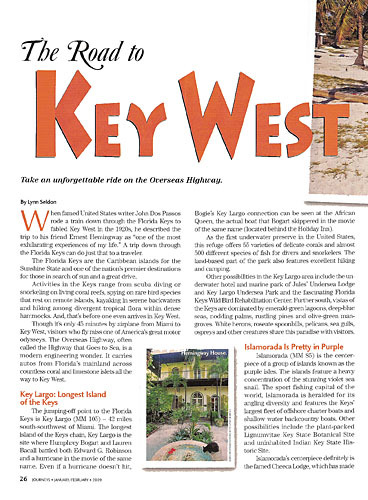 Of course, Key West features an endless array of historical attractions, quaint accommodations, creative dining and much more. But Hemingway's town also offers excellent scuba diving, kayak touring and other water-oriented options just offshore. Diving or snorkeling and kayak touring can show a completely different side of Key West. Even further afield, Fort Jefferson National Monument in the Dry Tortugas offers one of America's most unique outdoors outings. This former 19th century fort, reached only by boat or seaplane, now is a protected park that features great birdwatching, diving, snorkeling, camping and even more Florida Keys nature in abundance.